Could we do journalism in a new way? Could we ignore these editors without budgets and go directly to the readers, listeners and viewers and see if we could do journalism on a platform directly for them? Is it a crisis for journalism or is it a crisis for journalism’s business models? These are some of the questions freelance journalist Martin Schibbye was asking himself as the idea for Blankspot, a reader-backed reporting initiative from Sweden, was being shaped two years ago. Schibbye, now editor-in-chief and founder of Blankspot, spent 438 days in jail in Ethiopia after a reporting assignment, and found upon his return to Sweden that news organisations’ purse strings were too tight to allow them to commission the type of foreign reporting he wanted to pursue. Blankspot, which started operating after a crowdfunding campaign raised more than €122,000 in 2015, aims to cover underreported stories and create a movement of media literacy where journalists collaborate with the public throughout the reporting process. "Currently, in Sweden, there is a really lively debate about how to increase trust in media, but we did that already then [when the crowdfunding launched], emphasising the fact that you need to create a movement amongst the readers," said Brit Stakston, media strategist and chief executive of Blankspot. "It's really important that the readers are the ones defending journalism, because journalists will always be seen by those that criticise media as wanting to keep their jobs, wanting to keep their unique position of telling the world how things are. "So then you need to really work closely with your readers, your audience, and really make them carry the story on, giving everybody a vaccine that makes them really aware when people start questioning as well as react when people just randomly say that journalists are biased and are telling lies constantly. "You should defend journalism if you want to defend the democracy we have, so that's the aspect we always wanted to focus on as well." Blankspot manages topic-specific closed Facebook groups where subscribers or interested members of the public can contribute their knowledge about a subject and follow updates from the journalists working on a particular story. For a reporting project following the deportation of asylum seekers back to Afghanistan from Sweden, Blankspot journalists work within a Facebook group alongside 8,000 people. Groups have also been set up for stories on Gambia, Eritrea, the Swedish arms export, and other topics, with some more active than others depending on the number of stories published on each topic and whether the team has a group of reporters on the ground at any one time. Some 4,000 people subscribe to Blankspot, having signed up to pay either monthly or annually, while another 5,000 have donated to support the Afghanistan project. Between 50,000 and 60,000 read the site each month, and this figure has been growing steadily over the past six months, said Schibbye. 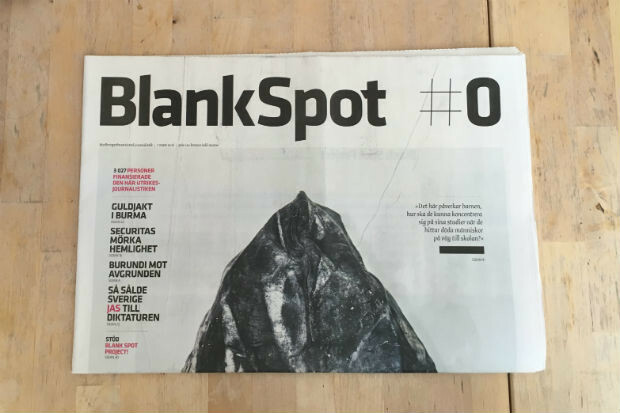 To reward and keep the subscribers who signed up as part of the initial crowdfunding campaign, Blankspot published a one-off broadsheet paper collecting their work from the first year, as a nod to the traditional journalistic hard work that goes into any story no matter the format in which it is published. The team currently consists of four full-time members of staff, and freelancers who come on board for specific stories. "It’s 24/7, more a passion than a job," said Schibbye. Blankspot is further exploring the use of Facebook groups as a way to connect with the audience through its current media literacy project, creating groups where school teachers and students can ‘follow’ journalists on a reporting trip and learn more about how journalism works. After the organisation ran a pilot project with one class, 20 classes will be following a story this autumn, with Schibbye holding lectures face to face with each group of students before and after the reporting trip. "It's a way of working with media literacy, it addresses all the issues regarding everything about fake news or media critics, and the change in not only consuming media but also producing media,” Stakston told Journalism.co.uk. "That's also a way we get funding, for doing the media literacy part, and a way of starting to explore more about journalism in relation to young people now."